Art.com is probably the largest poster site on the web today. There is another site, I believe owned by the same company, called allposters.com. Due to my experiences with both sites, I’d like to give the reader a few recommendations from a seasoned customer. Art.com can not only frame posters, it can also transfer them to canvas. I have no experience with this and also generally prefer photographic art which is not suited for canvas transfer, in my oppinion. So bear that in mind as you read this. 1.) Do not buy posters without framing; even if your local photo shop can frame these images, the selection and quality of frames from Art.com has been superior to the local photo shop where I once tried getting a picture framed; worse: one of the largest posters were actually destroyed by the local photoshop because it had no experience in handling such large posters. Of course this is just my limited experience but if you spend the extra money, which is not exactly cheap, you will get quality craftmanship from Art.com. I can only recommend Photographic and Premium Photographic Print if you have a more than casual interest in the art you buy, even if it is replicated art. 3.) By default, when you want a picture to be framed, Art.com will present you a picture with a mat around the picture itself. This is often not desirable – it doesn’t always suit the picture – especially large pictures and is more expensive as well. So by default your picture will often cost more and be less attractive than you’d want – therefore, always check how the picture looks without any mats (up to four mats are actually supported). 4.) There is an option to crop a picture which doesn’t seem to be supported for many pictures – I’ve never seen one where it was supported actually but in any event, what I wanted to use the cropping for was actually removing the mat around all pictures I tried to frame but that’s of course what the mat tool is for: just select 0 mats and you probably don’t want it cropped anyway. I must recommend the second option: Non-Glare Acrylic. It costs more but reflections on the glass can be very annoying when you just bought a large beautiful picture in Premium Photographic Print quality. 6.) The actual frames are quite high quality in my oppinion. The default frame SoHo is a beautiful discrete black frame which suits most pictures but there is a large varity of quality frames to choose from. I have nothing but positive things to say about the frames and craftmanship put into the framing so far. When you get a framed poster, there are two or more metal plates which have been fixed on the backside of the frame via screws and a woven steel wire is stretched out between the fixtures. It’s not going to be the frame itself that causes it to fall to the floor – it will be something like a small nail or some such. 7.) Be very careful when selecting your pictures. I recommend building up one or more custom galleries you can create. Spend a couple of hours surfing the site and adding to your own gallery, then review the gallery before choosing your pictures. 8.) Review the picture quality! It is not sufficient to select a great looking picture, you have to be careful that the source image resolution is indeed high quality. 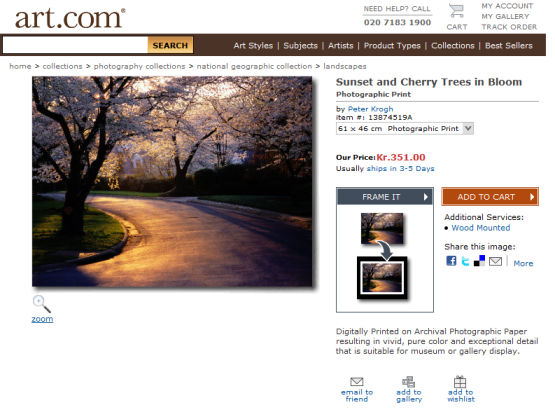 This is not actually an easy task as Art.com does not give you the full picture to see – nor with or without a watermark and it the enlarged preview picture is still too small to make a good estimate of source image quality. This is of course important as it really doesn’t matter if you choose Premium Photographic Print if the image is in too low a resolution or grainy or what not. There is no details about the source resolution and quality on Art.com. I quite suspect this is because they do not want people to drop a picture because of such parameters. Still, open the enlarged image and try to get a sense of the quality, at least if it’s very bad you can see it, but it’s no guarantee that the source image is of a satisfactory photographic quality. 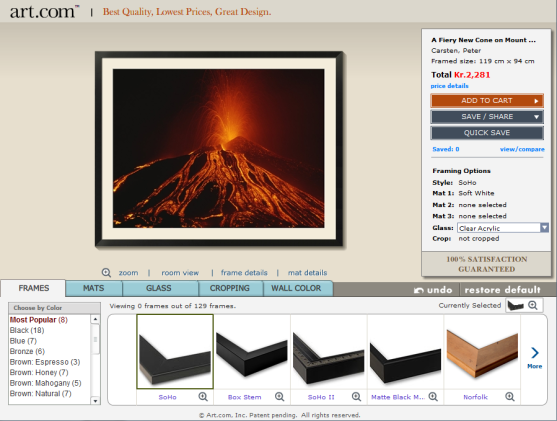 Also note that when you buy a picture, you cannot see on the receit what print quality you have chosen. I don’t know why Art.com does not show this but I don’t like that they exclude such information. It is of course possible to return the framed picture if you are dissatisfied with it – there is a 30 day money-back guarantee – but shipping can be expensive and cumbersome, not to mention if you want to ship it with some kind of insurance, which you probably do if the picture is expensive, which it will be, if you framed it, then it will be even costlier. 9.) Patience. Don’t choose a picture too soon, there’s a lot of good stuff there. Be patient and you will be a happier customer. Do you know of any other large web print and framing shops then don’t hessitate to comment and blog about them. This entry was posted in Art and tagged Add new tag, Art.com, Business, Frames, Photography, Picture frame, Shopping, The Untimely Consumer, Visual Arts. Bookmark the permalink.